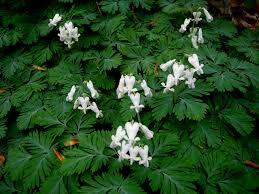 Squirrel Corn Plant - Dicentra canadensis. Squirrel Corn is a shade dwelling, herbaceous perennial with hanging or erect, greenish-white, creamed colored, or pinkish-tinged heart-shaped flowers, which bloom between April and May. Average heights of this high insect and disease resistant plant can range from 6 to 12 inches. The short stem, blue-grey, and smooth leaves give the foliage a fern-like appearance. The common name stems from the underground yellow clustered root system which resembles corn kernels. It can be seen growing in both the wild or gardens as a fragrant ornamental addition to the landscape. Squirrel Corn Plant is one of the most popular and best-known wildflowers around. This wildflower is seen a lot growing in parks and other areas. 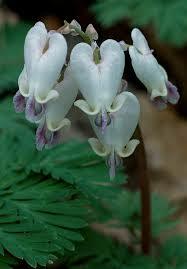 The flowers of Squirrel Corn will be a heart-shaped and a pale pink color when in bloom. These wildflowers will look great in flower gardens and natural areas when growing. This wildflower is used a lot as an ornamental plant for gardens. 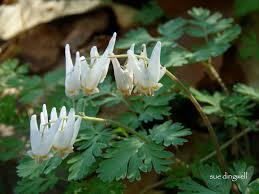 Squirrel Corn is a small herbaceous plant that is native to the Woodlands of eastern United States. This plant can be found growing in most moist woodlands and bogs. This plant grows in dry soils as well and can be found in various spots along the Appalachian mountain range. Squirrel Corn will go dormant for most of the year and will only appear in spring when it is time to bloom. The tubers for this plant are spread easily by small woodland rodents. Squirrel Corn is not for human consumption. Squirrel Corn Plant will make a lovely plant for a garden. It is often found growing in parks where they have extensive gardens. It also does excellent in average soils and will even grow well in moist soil conditions. Its blooms are heart-shaped and white. Squirrels and rabbits love squirrel corn.